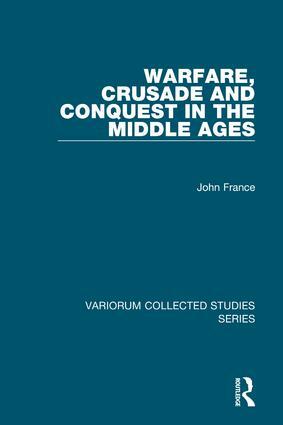 This volume brings together a series of articles by John France, published over a span of more than forty years, covering a number of aspects of the military and crusading history of the Middle Ages, both in Europe and the Near East. An interest in understanding how war worked and why informs a first group of articles, ranging from Carolingian armies to the organisation of war in the 13th century. The focus then turns to the Crusades, the most ambitious conquests of the era, with a set of studies on the First Crusade and others on the manner and conduct of warfare in the territories of the Latin East. The volume also includes a major unpublished analysis, co-authored with Nicholas Morton, of the problems faced by the local Islamic powers in the early Crusading period, reminding us that an army is only as strong as its enemies permit, and suggesting that the crusaders should be seen in this light. Contents: Introduction; Close order and close quarter: the culture of combat in the West; Property, warfare and the Renaissance of the 12th century; A changing balance: cavalry and infantry 1000-1300; The composition and raising of the armies of Charlemagne; The military history of the Carolingian period; The occasion of the coming of the Normans to southern Italy; The Battle of Carcano: the event and its importance; Holy War and holy men: Erdmann and the Lives of the Saints; Patronage and the appeal of the First Crusade; The departure of Tatikios from the crusader army; The crisis of the First Crusade: from the defeat of Kerbogah to the departure from Arqa; Two types of vision on the First Crusade: Stephen of Valence and Peter Bartholemew; The election and title of Godfrey de Bouillon; The First Crusade as a naval enterprise; Arab Muslim reactions to Turkish authority in northern Syria, 1085-1128; Logistics and the Second Crusade; Warfare in the Mediterranean region in the age of the crusades, 1095-1291: a clash of contrasts; Surrender and capitulation in the Middle East in the age of the crusades; Index. John France is Emeritus Professor of Medieval History at Swansea University, UK.